There’s something deliciously decadent about a hotel stay only ten miles or so from home. 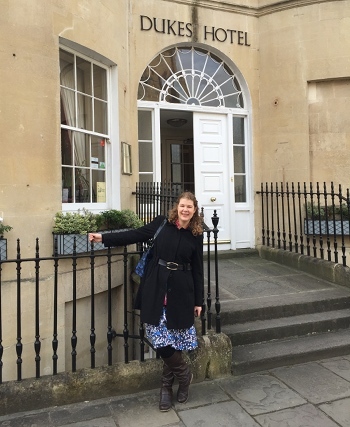 Add in the fact that our stay was at Dukes on Great Pulteney Street in Bath and I really felt I ought to have been swishing down grand staircases in a floor-length gown. We arrived soon after midday on a sunny March day and were warmly welcomed by Carole, who runs the boutique guesthouse with her husband Christopher. Reaching the property from Bath Spa train station meant a lovely stroll alongside the River Avon frothing over its weir, and across the 18th century Pulteney Bridge. 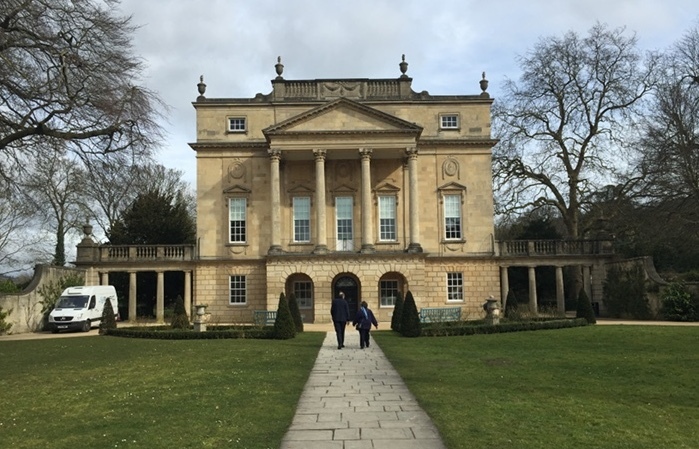 Bath is a famously pretty Georgian town with biscuit-coloured buildings, and few more striking than Great Pulteney, with a broad sweep leading the beautifully columned Holburne Museum. 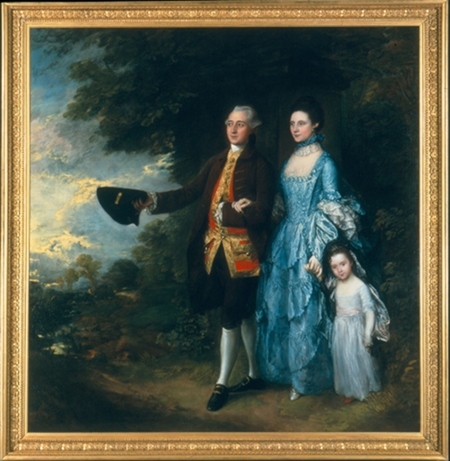 We dropped off our bags and heading straight to the museum, where we spent a happy afternoon ogling the permanent collection’s portraits (including this one of the Byam family by Thomas Gainsborough, with the child added later – fascinating to think how they altered their formal portraits over time!) and peering into narrow drawers showcasing intricately carved netsuke and the like. The museum has a lovely café overlooking the Sydney Gardens Vauxhall, where Jane Austen walked daily when living in Bath. 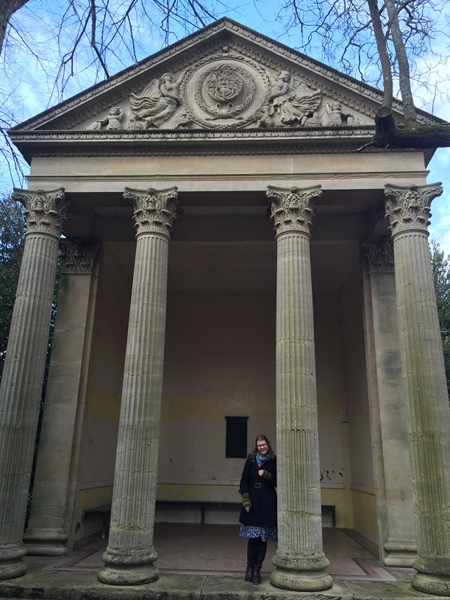 We meandered through it happily, admiring the many bridges crossing the Kennet and Avon Canal and railway, the Minerva Temple (pictured below), and a profusion of early spring flowers. Back at the hotel, we were shown to our room by Roman (as Carole commented, very appropriately named when you consider the town’s heritage! 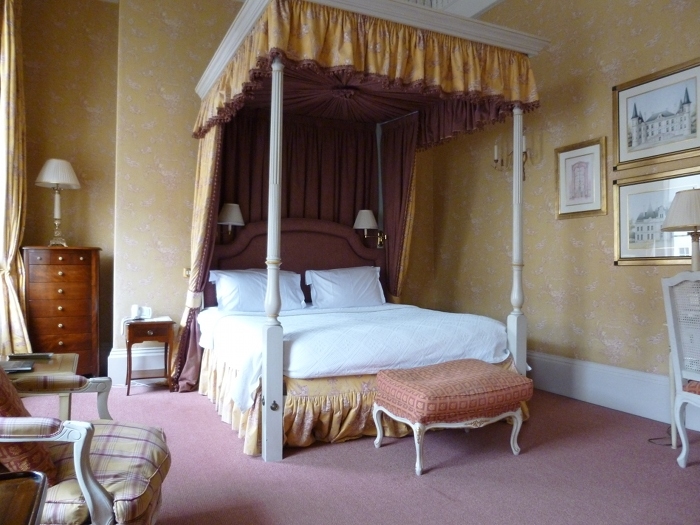 ), and found we’d been allocated the sumptuous Athol, one of two fitted with glorious four-poster beds. What a room! Luxurious, comfortable and utterly refined with numerous corners to nestle into and read or write, it’s the perfect retreat. 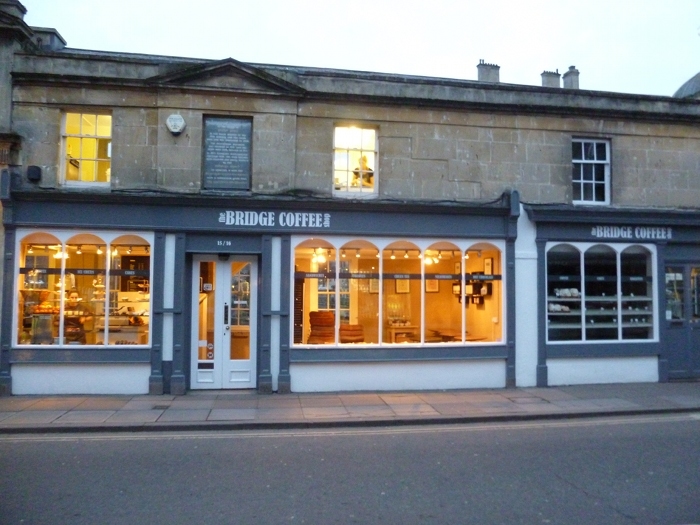 We ventured out again to explore the shops on Pulteney Street (and indulge in coffee and cake at the Bridge Coffee Shop, pictured below) and dip into the Victoria Gallery before ambling up to the Rostra Gallery and a whole array of dinky little independent shops selling assorted covetable things. Dinner that night was at the Huntsman, where we feasted on pheasant followed by creamy panna cotta. Downstairs it seemed to be open mic night, so we curled into a corner festooned with fairy lights and listened to an excellent miscellany of local musicians. The next morning we woke in our beautiful room and feasted on breakfast in the Duke’s dining room before leaving our bags at reception and heading off to the Thermae Bath Spa. Tucked away down a warren of streets just off the main shopping thoroughfare, the imposing structure has been controversial over the years (due mainly to its late completion and cost to taxpayers), but as marketing manager Charlotte Hanna says, any objectors who’ve sampled the spa’s services for themselves have found it difficult to maintain their annoyance with the place. In fact, it’s fairly impossible to hold onto annoyance of any kind. The waters of the only natural thermal spring in Britain eases muscles and minds alike, and after a couple of hours of mostly bobbing around I was in a semi-comatose blissed out state. I’d previously visited just a year after it opened when a few small kinks were being worked out, and was happy to find that in the seven years since it has only got better. The Minerva Bath, a large indoor pool, gave us the chance to acclimatise to our surroundings and enjoy drifting gently with the current. From there we climbed the stairs to the spa’s standout feature, the open-air rooftop pool, where sunlight bounced off the water’s surface and regular deluges of bubbles transformed it into a gigantic mineral-rich hot tub. The height of the building offers views over the surrounding buildings and countryside, which ensuring a sense of relative privacy, not that you’ll care once the tranquility kicks in. We wandered downstairs to the Aroma Steam Rooms, where four large pods each offer a different aromatherapy experience from sandlewood to lotus flower. In the centre of the room, a waterfall shower ranged from light mist to a tropical downpour, a great way to liven ourselves up after each steam. Time was slipping by so we headed back upstairs for one last sunlit wallow before heading to the Spring Restaurant to feed our relaxed selves on fresh fish, wine and salted caramel cheesecake. Well, we had to get those toxins back in somehow! Find out more about visiting the city at visitbath.co.uk.